People generally don’t think twice about their mouthwash. Only few people have though that it could be harmful for their bodies due to the toxic ingredients that it contains. However the fact that chemical mouthwash that are sold on the market can lead to oral cancer is more and more evident. A recent study conducted by the Leibniz Institute for Prevention Research showed that the alcohol contained in most formulations of mouthwash actually does appear to heighten the risk of oral cancer. While these findings are not conclusive, the scrutiny of the formulas of mouthwash was increased. The results of the findings have been appalling. Although the toxic content of the chemical mouthwash has been familiar still the public didn’t know how serious that is. Due to the will to save money many companies use toxic and cheap ingredients in the mouthwash and sell it to costumers who are unsuspecting. Were you familiar with the fact that there are companies that add formaldehyde in the mouthwash? Many mouthwashes have lots of harmful ingredients. Many conventional brands of mouthwashes have large amount of alcohol. The Dental Journal of Australia has revealed that chemical mouthwash that contain alcohol can be the reason for the development of mouth, throat and tongue cancer. Many brands of mouthwash have fluoride. Fluoride is good for fighting cavities but it is very bad for the body. This fact lead to the concern of the fluoride’s amount present in the tap water of the municipality.The excess ingesting of fluoride can cause some neurological issues. Also it is carcinogen. The worst ingredient of all is formaldehyde. Formaldehyde is usually found in household cleaners and glue. It certainly is not meant to be ingested. The U.S. Environmental Protection Agency declared formaldehyde to be a “probable human carcinogen” and research has shown that long-term exposure to formaldehyde is associated with different types of cancer, including leukemia. The home preparation of mouthwash has been recommended by lots of experts. The process is simple and it will exactly ensure you what is – and isn’t – in your mouthwash. For making mouthwash at home it is necessary to have a container. Many people like to use mason jars, but you can use any type of glass bottle or jar. To mix it effectively, you will want to boil the water first and add the herbs to it. Let it sit for 20 minutes, then strain and bottle it. Other popular ingredients are spearmint, raw honey and goldenseal. Because of the fact that the powder will be settled at the bottom of the glass jar, it will be necessary to the mouthwash to be shaken before each use. Put a couple of teaspoons of the homemade mouthwash in the mouth. Start gargling but don’t swallow. Homemade mouthwash is much, much cheaper than store-bought mouthwashes. Best of all, it doesn’t have any alcohol or toxic chemicals in it. Conclusion: It is more more evident that cancer and mouthwash are strongly connected. You will only know what you put in your body if you make this cancer-free homemade mouthwash. Summary: It was revealed that lots of mouthwash brands on the market include toxic chemicals that are related to cancer development. 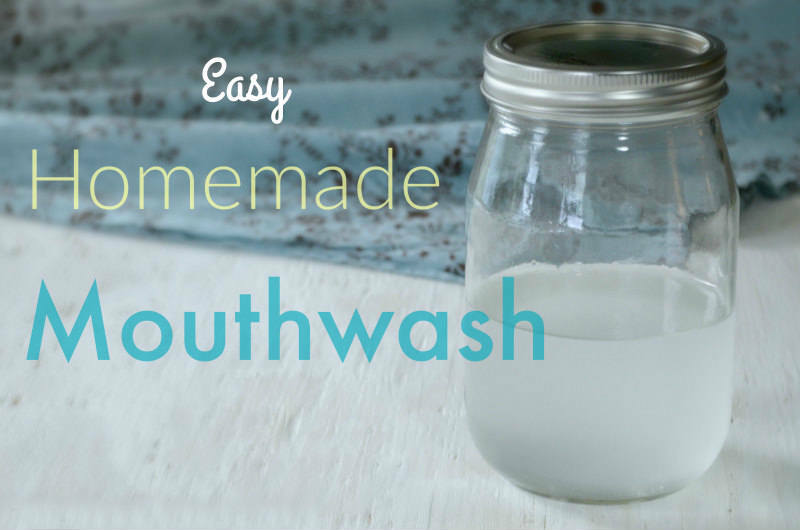 Lots of people make this homemade mouthwash at their homes to save money and stay healthy.